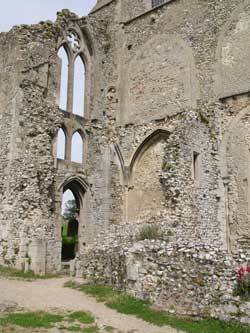 The South Aisle originally opened into the parish church and it is not certain why it was taken down at the dissolution of the priory: it may have been that removing the cloisters and other abutting buildings rendered it unstable or it may simply be that the cloister wall was deemed to block too much light from the church inside, and a deal was struck to use some of the cloister windows in the fabric of the church in exchange for the stone of the aisle. The butress at the east end, and the two smaller ones between the second and fourth bays are later additions, and the flat topped windows are part of this tudor infill of the norman arches. 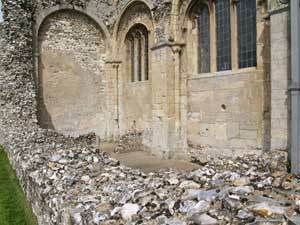 The aisle is divided into sections which would be chapels dedicated to a particular saint, or perhaps guild chapels and chantries; some have holy water stoops still remaining. 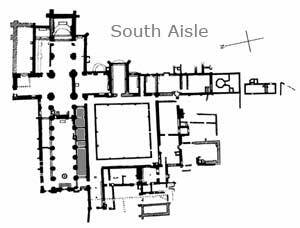 They may not have been staffed by the monks as there were sufficient chapels in the Presbytery and Transepts for each one to say mass daily. The vicar of the parish would have celebrated here, so would others – particularly the Friars – who had been left money in wills to say mass for the soul of their benefactors. 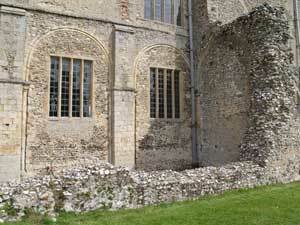 There were six guilds at Binham in the late middle ages: All Saints, Corpus Christi, St Alban, St John the Baptist, St Mary and St Thomas (a Becket) – the last presumably being responsible to the maintenance of the Chapel of St Thomas by the gate into the parish church. 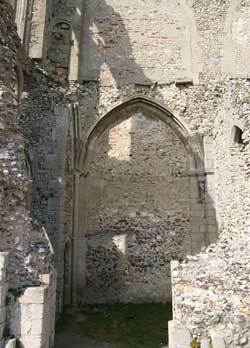 At the West end of the aisle there is the remains of the church's South Porch, which was cut off when the West Front was added to the priory. The area is slightly depressed, and in the NW corner there is a stair to the roof. 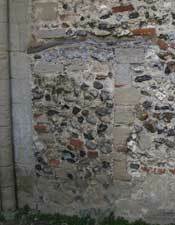 Set into the infilled arch is an interesting feature, which could be a doorway (?). 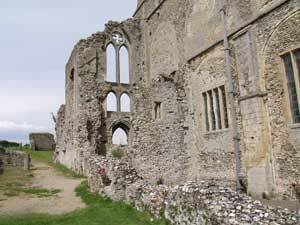 A small window (splayed inwards) looks out from the east wall of the porch down the aisle ruins. It is post-dissolution, and far too high for anyone to see out of. 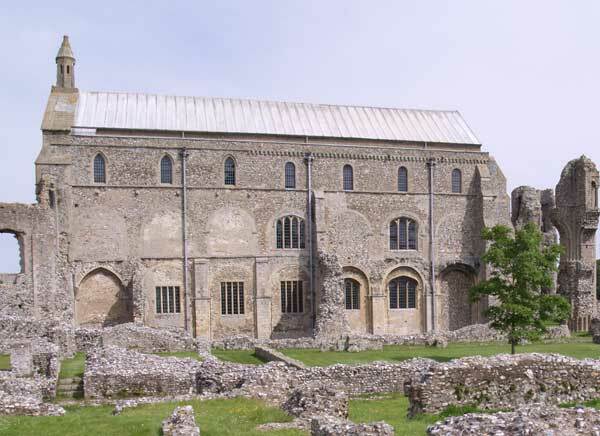 The last bay with its access both to the cloister and the west front would always have been used as a porch, and may have been used in monastic processions. When the aisle was taken down the window was probably added to allow more light into the room.